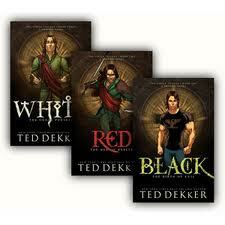 It was a few years ago that my son Josh and I read a trilogy of books by Ted Dekker. In the mythical universe of Black, Red and White, mankind is divided into two groups. One group follows the God Elyon and the other group rejects him outright. They will not worship him or follow his teachings. It’s easy to tell if a person worships Elyon – his followers have skin like ours. But those who reject him have a painful skin disease that forms scabs all over the body. This group must therefore coat themselves daily with a paste to continue moving without significant pain. The cure for this disease is to bathe in the pool of Elyon, but the touch of water is quite painful to those with scabs, and they have thus come to think of Elyon worshipers with their smooth skin as weird and unnatural. But to the followers of Elyon, it’s obvious. Something is wrong with the world, and it’s obvious to me. Ah, sinful nation, a people laden with iniquity…will you continue to rebel? Before I say any more, allow me to offer this disclaimer – in a fallen world, all of us have pain, physical and psychological, including those who love the Lord with all their heart, soul, mind and strength. We will never escape the pain of the fall until the curse is fully and finally removed (Revelation 22:3). But all around me I see so clearly what Isaiah saw – bruises and sores and raw wounds – the effects of sin, of a life lived apart from Christ. More and more, all around today I see dreaded skin diseases on broken people who in many ways could be wonderfully healed if they would worship, serve and walk in the ways of the Lord Jesus. What do they see? I don’t know – maybe a foolish religious guy who oversimplifies things. Or maybe it sounds like I am claiming to be a better person. Holier than thou? Well, in answer to this, I must say that I have brought pain into my own life again and again by my sin. And I have known pain from the sin of others. My skin has not been free of sores. But I will testify that I have been rescued by a Savior who through his word has made me a new creature in Christ. And through His empowering Spirit he has transformed me through the years. I am not what I was. And now, reading this today, you may for just a moment be granted the sight to see what to many is obvious – you may for a moment see what sin has done to you – how it has made your whole head sick and your whole heart faint. And if for just a moment, you see this…then I testify that there is hope for you. Ask Him to take your broken life…and make it something beautiful.